This Airbus ACJ319, operated by MJet, is on display in the MEBA static aircraft area, on behalf of Airbus Corporate Jets. 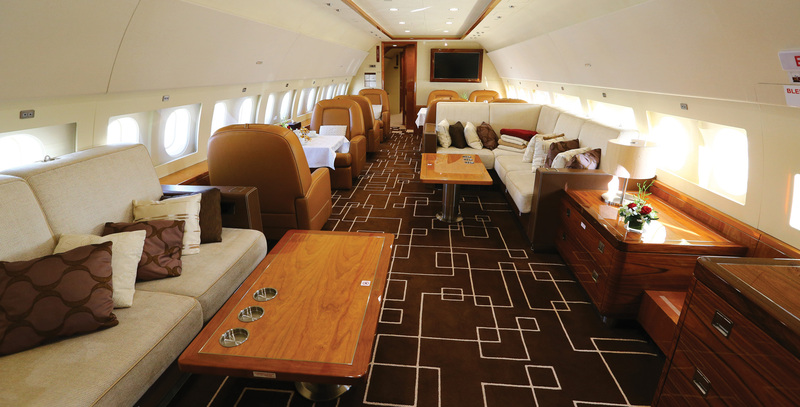 Airbus Corporate Jets has had a strong presence in the Middle East, reaching back to the mid-1980s. To help cement that presence the company is displaying an ACJ319 at MEBA. Illustrating the ability to provide various zones within its capacious cabin, the 19-passenger aircraft operated by MJet is configured with a full-service galley and several different lounge areas, including berthable seating, and a bedroom with en suite shower/bathroom facilities at the rear of the cabin. Austria-based MJet added the ACJ319 to its charter fleet in February this year. Being based on the globally successful Airbus single-aisle airliner, the ACJ family offers very high levels of reliability, and access to a comprehensive worldwide support network. The ACJ offers fly-by-wire controls, a feature that is only just being adopted by traditional business jets, as well as Cat 3B full autoland capability. Meanwhile, the Toulouse, France-based Airbus Corporate Jet Centre has appointed Vincent Tchengang as its new head of services sales. Having previously served with ACJC as customer support director, Tchengang then became Africa/Indian Ocean regional sales director for parent company Airbus. Now he heads a team of sales directors covering cabins, airframes and engines for ACJC, as well as taking personal responsibility for Africa, Australia, eastern Europe and south Asia.